Our clinic offers “One time endoscopy” through diagnosis to treatment, which able the patient to avoid hospital stay or any other strain. The examination is backed up by the highest techniques also with minimum pain. Patients will be advised to take a full rest in our private recovery room. Additionally upper GI endoscopy and colonoscopy can be performed at the same day, also with blood test, Ultra Sonic examination, Helicobacter Pylori test and any other test required. All endoscopy units are the latest model with NBI system and High-Vision magnifying system, also using a High-Vision monitor, enables us to detect early stage cancer and provide confident diagnosis from clear endoscopy images. As for an infection control, all devices used in polypectomy or biopsy are single use devices, and also using OER2 from Olympus, the most recommended sterilizer by Japan Gastroenterological Endoscopy Society, we take full precautions to infection control. Our clinic was founded as a gastric and colonic specialized clinic, from the directors 15 years of experience of cancer treatment in National Cancer Center, we offer not only gastric or colonic cancer screening but other body part cancer as well. Coordinating with other Japanese top tier hospitals, we offer other painless cancer screening using imaging technologies such as CT, MRI and PET diagnosis. Also sometimes breast cancer or uterine cancer screening for elderly female involves pain. We offer MRI and CT for these gynecology cancers screening as well. As in Japanese medical insurance system, using the public insurance and private practice is prohibited; there is a strong constraint in what we can offer as the best practice. For example, certain test for gastric cancer risk analysis; Helicobacter Pyloric test, pepsinogen blood test, or like wound closure treatments after rececting large colon polyps to prevent late bleeding can not be reimbursed by the public medical insurance. From this circumstance, and to meet our patients request for the best quality of medicine, we ask for private practice system for all endoscopy procedures. 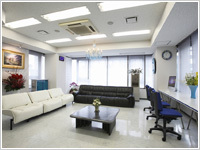 The waiting room is designed to make our patients time in the clinic more comfortable as possible. Large and luxurious waiting room filled with relaxing aroma and music, Venetian glass chandelier, drawing of THOMAS KINKADE, and Japanese Ikebana makes the space more relaxing and comfortable. We have received many suggestions especially from female patients for both and pre & post procedure privacy. To support this, all recovery rooms are built fully private. All rooms are equipped with Reclining beds, Digital TV, Humidifier, Air cleaner and other amenities. 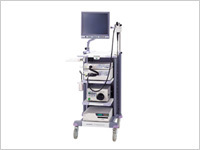 We use the “EVIS LUCERA SPECTRUM” video endoscope system by Olympus. This system can observe by High-vision normal light and also has the NBI (Narrow Band Imaging) system which can enhance the capillary vessel and the surface pattern of the mucosa. Using this NBI is very useful for detecting small cancer in esophagus and pharynx, also for more accurate diagnosis of defining the range of gastric cancer. At American International College of Gastroenterology in 5th May, the director Dr.Fujii made a lecture on the high efficacy of using NBI and High-Vision magnifying endoscope for early detection of depressed type cancer in colonoscopy. This endoscope enables to observe from normal magnification, about×5, up to ×100 with high quality image. Because of High-Vision Magnifying Endoscopes clear image, polyps found at normal magnification and increasing the magnification to×100, it is possible to diagnose its malignancy instantly. Especially for those lesions that suspect malignancy, NBI, staining is combined to decide endoscopy resection or surgery. 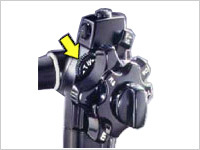 However not anyone can diagnosis by using magnifying endoscope. The director Dr. Fujii’s special experience in pathology had leaded his interest with the comparison between the magnifying endoscopic image and the pathological results. With this experience and passion, estimating the pathological results from endoscopic image, he is able to complete from diagnosis to treatment with in a single endoscopic procedure. When a polyp or an early stage cancer is detected, several devices are used to resect the lesion. For example, biopsy forceps when taking tissue, hot biopsy forceps, polypectomy snare, injection needle and hemostasis clip for therapeutic procedure. We use only single use device for these kinds of devices. Using a single use device is important not only from contamination risk management point of view but for accurate and efficient therapeutic procedure as they provide consistent performance. 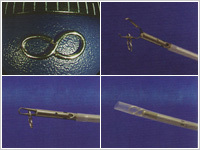 Additionally the picture shows a device called “8-ring” designed and awarded patent by the director Dr. Fujii, used after resecting large polyp or early stage cancer. 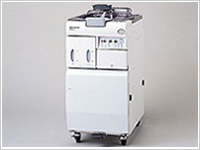 This machine sterilizes the endoscopy by using peracetic acid. It is effective to both bacteria and viruses, most recommended by the Japanese society. Other related equipments are also sterilized by using both ultra sonic rinsing and autoclave sterilized. We offer safe endoscopic procedure by full contamination risk management with full sterilized implements. To offer our patient safe and comfortable examination, the amount and variety sedation is also considered by the director as well. 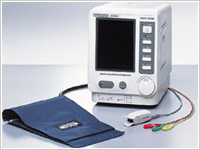 This machine monitors the patients’ blood circulation dynamics during the examination for safe endoscopic procedure.